A new poll by the Kaiser Family Foundation reports that a majority of Americans--60%--want Congress to improve the existing Affordable Care Act rather than repeal it (35%). A Kaiser tracking poll reports that 48% of Americans want to keep and improve the Affordable Care Act while another 8% want to keep it as is -- for a total of 56% who want to keep the law. 19% are in favor of repealing the law and not replacing it and 12% want to repeal and replace with a GOP alternative, for a total of 31%. A new poll by CBS News poll reports that 72% of Americans disapprove of the shut down of the federal government over the Affordable Care Act while 25% approve. The survey also notes: "Republicans in Congress receive more of the blame for the shutdown: 44% of Americans blame them, while 35% put more blame on President Obama and the Democrats in Congress. These views are virtually the same as they were last week before the shutdown, when Americans were asked who they would blame if a shutdown occurred." A new poll by Quinnipiac reports that American voters, by a wide margn, oppose Congress shutting down the federal government to block implementation of Obamacare, 72% to 22%. A new poll by Bloomberg reports that a plurality of Americans-- 43%--believe that President Obama's health care law should be retained "with only small modifications"; 15% say the measure should be left alone; and 33% say it should be repealed. Nearing a full year since passage of the health care bill, a new Gallup poll reports that Americans remain divided about whether it was a good thing or a bad thing, with 46% saying it was a good thing and 44% saying it was a bad thing. 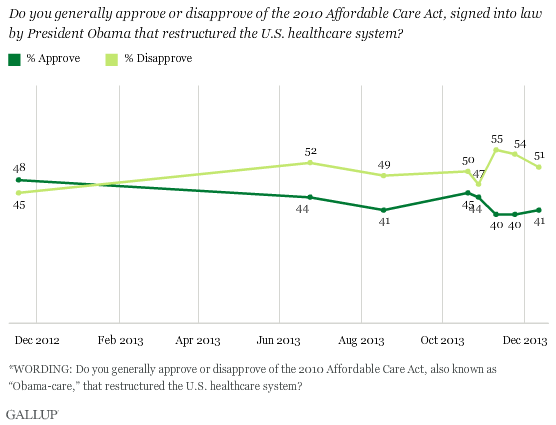 44% also believe the law will make medical care worse, versus 39% who say the law will improve medical care. A just released survey by CNN/Opinion Research reports that 54% of Americans continue to oppose the new health care law; 43% support the law. 25% of say they oppose the new law because it is not liberal enough; 37% oppose it because it is too liberal. According to a study in The New Republic, health care reform doomed the Democratic Party in the midterm elections. The study found that of the 1/6th of voters who identified health care as their most important issue voted Republican over Democrat, 59% to 35%. The study continues: "Putting all these data together, it is hard to avoid the conclusion that the health-reform bill had an independent impact on Democrats in the midterm election, reducing their support below the level to which the economy alone would have depressed it. A back-of-the envelope calculation suggests that health care voters contributed about 10 percent points to the Republicans' share of the vote and only 6 percent to Democrats -- a gap of 4 percentage points." An in depth survey from the Kaiser Family Foundation suggests that Americans are becoming increasingly supportive of the new health care reform law. This month, the number of respondents approving of the legislation is actually higher than disapproving: 48% support the law, while 41% had an unfavorable opinion. Just a month ago, the levels of support were reversed, with 41% approving and 44% against. It does not appear that President Obama has received more than a slight improvement in his approval numbers, a week after in historic victory in congress. Last Sunday, Obama's three-day rolling average reported a 46% approval and 48% disapproval rating. As of this Sunday evening, the numbers are reversed 48.0% approve to 46.5% disapprove--an aggregate +3.5% improvement in his overall performance numbers. The two daily tracking polls--Rasmussen and Gallup--show no movement at all (with a slight decline in the latter survey). The president's numbers in the coming weeks will give us a clearer picture of the effect, if any, of his historic victory on his approval rating. A new Kaiser Health Tracking Poll, suggests that Americans do not fully understand the provisions and details of the health care legislation just passed by congress. For example: "Only 15% of Americans, for instance, know that the nonpartisan Congressional Budget Office has said the legislation will decrease the federal budget deficit over the next 10 years. And 55% believe the CBO has said the legislation will increase the deficit over that period." According a new Gallup survey, "Americans mention unemployment or jobs (31%) more than any other issue when asked to name the most important problem facing the country today. Americans predict the federal budget deficit will be the top problem the U.S. will face 25 years from now, just ahead of the economy and the environment." As for the present top problems, "31% of Americans mention jobs or unemployment, significantly more than say the economy in general (24%), healthcare (20%), or dissatisfaction with government (10%)." A new Gallup survey reveals that "Americans remain more confident in the healthcare reform recommendations of President Obama (49%) than in the recommendations of the Democratic (37%) or Republican (32%) leaders in Congress. But these confidence levels are lower than those measured in June, suggesting that the ongoing healthcare reform debate has taken a toll on the credibility of the politicians involved." According to a new Gallup survey, "Americans are skeptical that lawmakers will agree on a new healthcare bill at Thursday's bipartisan healthcare summit in Washington, D.C. If an agreement is not reached, Americans by a 49% to 42% margin oppose rather than favor Congress passing a healthcare bill similar to the one proposed by President Obama and Democrats in the House and Senate. By a larger 52% to 39% margin, Americans also oppose the Democrats in the Senate using a reconciliation procedure to avoid a possible Republican filibuster and pass a bill by a simple majority vote." The public often forms opinion based on the overall contours of an issue--rather than inside-the beltway details--an observation that seems particularly true of its reaction to health care reform. A Pew Research poll reveals that just 32% of Americans know the health care reform bill received no support from Republican Senators; just 26% know that 60 votes are needed to break a filibuster in the Senate. And, as other polls have confirmed, even fewer understand the basic provisions of a bill that is both cumbersome and has remained mostly unexplained to the American public. 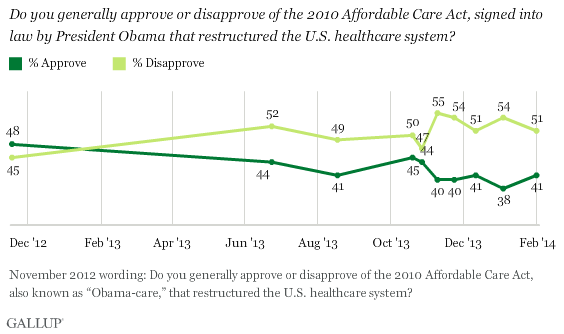 Was Health Care A Miscalulation? Was the Obama administration's emphasis on health care over jobs "a colossal miscalculation" of public sentiment and needs. Charlie Cook, in this interesting and compelling analysis, tied the drop in support for the administration to its year-long health care campaign, undertaken during a period when jobs were withering away and the unemployment rates was rising to crisis proportions: "Honorable and intelligent people can disagree over the substance and details of what President Obama and congressional Democrats are trying to do on health care reform and climate change. But nearly a year after Obama's inauguration, judging by where the Democrats stand today, it's clear that they have made a colossal miscalculation. The latest unemployment and housing numbers underscore the folly of their decision to pay so much attention to health care and climate change instead of focusing on the economy "like a laser beam," as President Clinton pledged to do during his 1992 campaign. Although no one can fairly accuse Obama and his party's leaders of ignoring the economy, they certainly haven't focused on it like a laser beam." For the entire analysis, click here. A new NBC News/Wall Street Journal poll confirms what last night's returns from Massachusetts infer: health care reform is not popular. In the survey, only 33% of Americans say President Obama's reform effort is a good idea; 46% consider it a mistake. Will the president's sagging approval numbers start moving up soon? Jacob Weisberg, writing in Slate, suggests that the answer may be yes: "About one thing, left and right seem to agree these days: Obama hasn't done anything yet. . . . This conventional wisdom about Obama's first year isn't just premature—it's sure to be flipped on its head by the anniversary of his inauguration on Jan. 20. If, as seems increasingly likely, Obama wins passage of a health care reform a bill by that date, he will deliver his first State of the Union address having accomplished more than any other postwar American president at a comparable point in his presidency. This isn't an ideological point or one that depends on agreement with his policies. It's a neutral assessment of his emerging record—how many big, transformational things Obama is likely to have made happen in his first 12 months in office." According to a new Washington Post/ABC News poll, Americans are evenly and "deeply" divided" on the heath care reform proposals before Congress: 48% support the proposed changes while 49% are opposed. One positive sign for supporters of the legislation: "The Democrats have made some progress among at least one key group. Support among senior citizens, while still broadly negative, is up 13 points since September to 44%. Seniors have also tilted back toward Obama when matched head to head with congressional Republicans on dealing with health-care reform, helping the president to a 13-point advantage over the GOP on this issue." According to Gallup, Americans are uncertain about the health care proposals winding their way through congress: "Americans are evenly split on the potential impact of new health care legislation, should it ultimately be passed into law. Forty-one percent say a new health care bill would make the U.S. health care system better in the long run, while 40% say it would make things worse . . . Americans are more negative about the impact of a new health care bill on their personal situations than they are about its impact on the nation as a whole. By a 10-point margin, Americans are more likely to say a new bill would make their personal health care situations worse (36%), rather than better (26%). Almost 4 out of 10 say a bill would make no difference, or have no opinion on the topic." Health Care: A Net Plus For Obama? One thing PollTrack will be monitoring very closely over the next few months is the relationship between the president's approval rating and the success or failure of the health care legislation currently working its way through congress. At the moment, high unemployment numbers and the looming deficit has taken their toll on independent voters--their loss from the Democratic fold representing the single most important factor in the party's losses in Virginia and New Jersey last week. Will the success of health care legislation--such as last Saturday's victory in the house--help to offset dissatisfaction among independent voters? The answer may well spell a continued Democratic majority next November or Republican gains. Stay tuned for analysis of this issue relative to the president's overall standing with voters. According to a new Washington Post/ABC News poll, "support for a government-run health-care plan to compete with private insurers has rebounded from its summertime lows and wins clear majority support from the public. . . On the issue that has been perhaps the most pronounced flash point in the national debate, 57 percent of all Americans now favor a public insurance option, while 40 percent oppose it. Support has risen since mid-August, when a bare majority, 52 percent, said they favored it. . . .If a public plan were run by the states and available only to those who lack affordable private options, support for it jumps to 76 percent. Under those circumstances, even a majority of Republicans, 56 percent, would be in favor of it, about double their level of support without such a limitation." While somewhat a odds with recent polling from other organizations, Rasmussen reports that "44% of voters nationwide now favor the health care reform plan proposed by President Obama and congressional Democrats. That's little changed from a week ago.The latest Rasmussen Reports national telephone survey finds that 50% are opposed to the plan. The numbers have been remarkably stable throughout the debate"Rasmussen continues: "Last week, support for the plan rose to 46%, up five points from a week earlier. With the exception of “bounces” following a couple of nationally televised presidential appearances, it was the first time support for the congressional health care effort had risen." US Voters Oppose Health Insurance "Penalty"
According to a new Rasmussen survey, a majority of US voters oppose the provision in health care legislation that would require young and healthy Americans to either buy health insurance or pay a $750 annual penalty for not having it. 55% of U.S. voters now oppose that proposal; just 32% of voters think young and healthy Americans should be forced to purchase health insurance or else pay a penalty. 14% are not sure. Among voters ages 18 to 29, 29% favor the provision, known as “the individual mandate,” while 57% are opposed to it. Last weeks polling from Rasmussen Reports on the subject of health care reform suggests a mixed bag for proponents and opponents of the plan now before congress: "Sometimes, as the old saying goes, the devil's in the details.Most U.S. voters (54%) believe that major changes are needed in the U.S. health care system. Sixty-one percent (61%) say it's important for Congress to pass health care legislation this year. The problem is that just 41% of voters nationwide now favor the health care reform plan proposed by President Obama and congressional Democrats." For more of Rasmussen's analysis, click here. Americans see affordability as the nation's biggest health care concern, according to a recent Gallup survey: "In an open-ended question, Americans are most likely to say cost (38%) is the biggest problem with health care in the United States today, followed by too many uninsured (15%), and insurance companies (13%)." There is a major gap in the perception of this issue, however, depending on the respondent's own insurance status: "A question asking whether health care costs pose a major problem, a minor problem, or no problem personally for respondents provides another indication of the broad gap in concern about healthcare between the insured and the uninsured. Seventy-two percent of the uninsured say costs are a major problem. By contrast, 42% of adults with private insurance, and 40% of those with Medicare/Medicaid, say this." To a considerable degree, Americans remain uncertain about the scope and cost of health care proposals now being considered by Congress, according to a new Gallup poll: "Americans are skeptical that President Obama's health care plan will be able to accomplish all he intends -- to expand coverage to nearly all Americans without raising taxes on middle-class Americans or affecting the quality of care. 38% believe his plan will achieve all of these goals, while 60% do not think it will. Republicans are nearly united in thinking the plan will not accomplish these stated goals (90% believe it will not), and most independents (64%) agree. Two in three Democrats (66%), on the other hand, express optimism that the plan will achieve these aims . . . Less than a majority [of all polled, 43%] say they are confident that Obama's plan can be paid for mostly through cost savings in Medicare and other parts of the healthcare system, as Obama has proposed. 11% are very confident of this." Significantly, the survey concludes that "Although the public stops short of saying reform will make these things worse -- given that about one in five expect the reforms not to make a difference either way -- in three of the four areas, more predict health care legislation would make the situation worse rather than better. These are key considerations given that support for a healthcare plan -- currently 50%, including "soft" support -- could drop considerably if Americans were convinced that reform would have a harmful effect on the middle class through higher taxes, higher costs for health care, or reduced coverage or quality of care." Analyzing a just released national poll from ABC News/Washington Post, CQ Politics spots an ominous sign for the GOP: Americans perceive the party as obstructionist. CQ writes: "Republicans are viewed as obstructionists who are not making a good faith effort to cooperate with Democrats in the health care debate, according to [the survey]. The same poll found that half the respondents thought Democrats were making an honest effort to cooperate with Republicans on health care. Sixty-two percent of the respondents said the Republicans were not negotiating in good faith. But if there is any political blow back from this, it's hard to find. People were evenly divided on whether they would vote for (22 percent) or against (23 percent) a congressional candidate who supports the Democrats' health overhaul plan, with 54 percent saying it would make no difference to them. Forty-nine percent said they think the two parties are equally to blame for the tone of the debate." According to a Rasmussen Reports poll, nearly half of likely voters think the health care overhaul proposed by President Obama and backed by Democrats in Congress will become law this year. Yet, about half of likely voters don't like the plan. Around 50% said that they believed the overhaul would lower the quality of health care, and in answer to a separate question 52% said it would make health costs rise. By an enormous margin, the American public trusts President Obama FAR more than Republicans on the issue of who better can handle revamping health care: a NYT/CBS News poll reports that by a 55% to 26% margin, Obama has better ideas on health care than Republicans. A GWU Battleground survey released late last week found Obama with a 21 point lead over Republicans on who would better handle health care reform. PollTrack suggests that with approval numbers this high on the issue, Obama still holds a big political advantage over Republican legislators heading into September's Congressional battle over the issue. A recently released survey reports that "61% of voters nationwide say that cost is the biggest health care problem facing the nation today." The national telephone survey finds that "just 21% believe the lack of universal health insurance coverage is a bigger problem. Only 10% believe the quality of care is the top concern, and 2% point to the inconvenience factor of dealing with the current medical system. Given a choice between health care reform and a tax hike or no health care reform and no tax hike, 47% would prefer to avoid the tax hike and do without reform. Forty-one percent (41%) take the opposite view." There is wide support for government run health insurance, according to a New York Times/CBS News poll: "Americans overwhelmingly support substantial changes to the health care system and are strongly behind one of the most contentious proposals Congress is considering, a government-run insurance plan to compete with private insurers . . . The poll found that most Americans would be willing to pay higher taxes so everyone could have health insurance and that they said the government could do a better job of holding down health-care costs than the private sector . . . The national telephone survey, which was conducted from June 12 to 16, found that 72 percent of those questioned supported a government-administered insurance plan — something like Medicare for those under 65 — that would compete for customers with private insurers. Twenty percent said they were opposed.